The VLA conference is about a week out and as you think about what to pack, please consider bringing a gift basket for the VLA Scholarship Basket Raffle. The raffle is one of the most popular events at the conference and the baskets are donated primarily by VLA members. Monies raised support the annual VLA Scholarships and help future librarians complete their education. 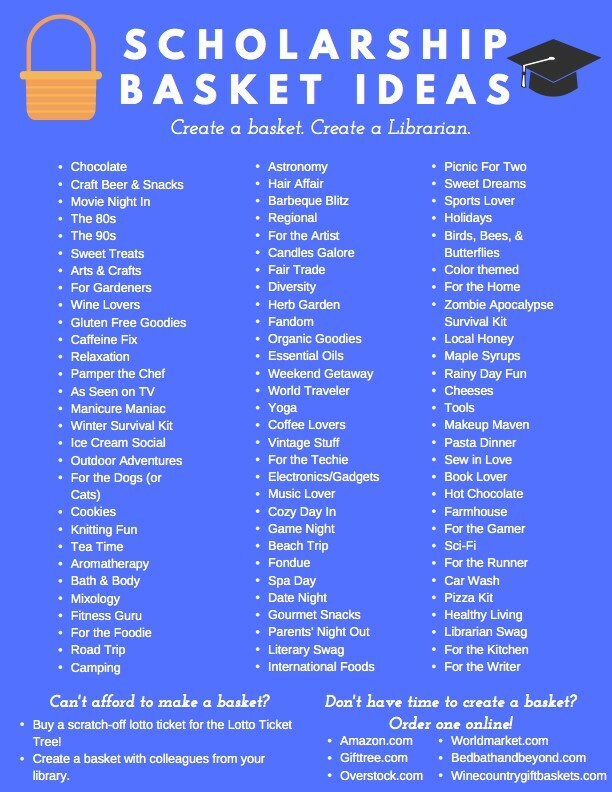 Ideas for baskets: Not sure of a theme for your basket? Check out this graphic containing nearly 90 possible ideas! Pre-pay for your tickets: Save yourself some time and purchase your tickets in advance, then visit the Scholarship Booth during the conference and pick up your tickets! Pro Tip: Bring stickers with your name and phone number on them to put on your tickets -- saves a ton of time! Lottery Scratch-off Tickets: Can’t organize a basket this year, but still want to help? Purchase some inexpensive scratch-off lottery tickets for our first ever lottery ticket trees! You’ll help raise money for VLA scholarships - and possibly make one lucky conference attendee a millionaire! Where to See the Baskets & Buy Tickets: Come see the baskets and buy tickets at the Scholarship Basket Raffle booth outside the Exhibit Hall on the Lower Level of the conference center. The Scholarship Booth hours are Thursday, September 27, 8:30am - 5:00pm and Friday, September 28, 9:00am - 2:00pm. The Scholarship drawing will take place at the conclusion of the VLA Business Meeting on Friday afternoon. You do not need to be present to win. Your basket can be picked up by a colleague, but must be claimed by 4:00pm on Friday. Want to donate a basket? : Baskets can be dropped off at the Scholarship Raffle table at around 8:00am on Thursday, September 27. If you plan to bring a basket, please email me at [email protected].